Have you heard of the new fun activity that is becoming very popular amongst kids and parents? Painted rocks. This creative activity began as a fun way to interact with kids on a global level. This rock painting and hiding phenomenon is a way to get kids outdoors and spreading joy and kindness. Consequently, kids and parents go outdoors and find rocks, paint them with any fun, imaginative images, patterns, etc. Then they take the rock with them as they run errands around town. They find a unique place outside to leave the rock for someone else to find, and in turn, they stay on the “lookout” for fun rocks of their own. As a result, the rock hiding phenomenon has reached far and wide already. 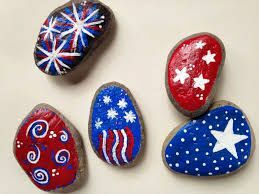 Painted rocks are hiding and being found all over including Jacksonville, North Carolina; Weymouth, Canada; and Redding, California. The rocks are bringing smiles to face everywhere. Here in Southern California, you can find the rocks at parks, outside of grocery stores, and at local swimming pools. We have been excited to get in on the rock painting fun. So this weekend we decided to create some holiday inspired rocks, Fourth of July firework rocks. My kids loved painting the rocks. Even my youngest was excited to join in. Afterward, we hid some at the fountain at the mall, one at the community pool for swim lessons, one at the fireworks event, and one at our neighborhood park. Where will you hide your rocks? This entry was posted in Activities and tagged Activities, creativity, kids, painting, rock hiding, rock painting, rocks, spreading joy, spreading kindness, summer, summer fun, the boys store on July 3, 2017 by Lacy.